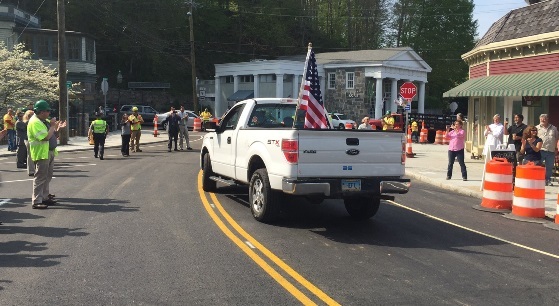 CHESTER – Ten days ahead of schedule, Chester’s Main Street Bridge reopened to pedestrian and vehicular traffic after a ribbon-cutting ceremony on May 12. 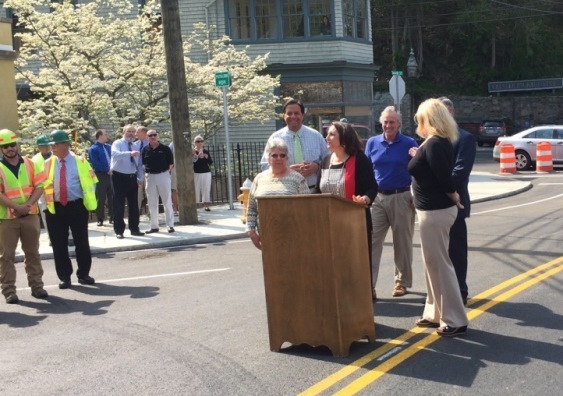 First Selectwoman Lauren Gister received only one day’s notice about the ceremony, yet even so, she was able to get the word out – and in small-town fashion, the word spread fast! About 100 people were on hand for the 3:30 p.m. ceremony, including fascinated small children who have been watching the work since it began in early January. First Selectwoman Lauren Gister, with Selectwomen Charlene Janecek (left) and Carolyn Linn (right). 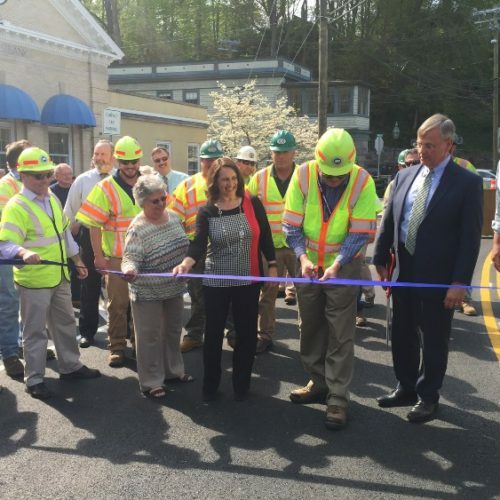 Gister thanked the Chester Merchants Association, “who have been incredibly patient and stalwart and put up with a lot of noise and dirt and lack of parking.” She thanked the Economic Development Commission and the Main Street Project Committee for their work before and during the project. Sadly, he never got to supervise the Main Street Bridge project, because of his illness leading up to his death. Louie Heft’s famous white pickup was the first vehicle to go over the Main Street Bridge after the ribbon was cut. The Main Street Bridge is owned by the State of Connecticut. 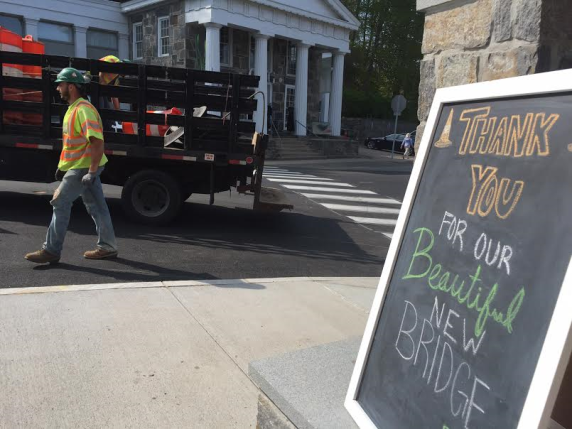 Decades ago, the town purchased Main Street for $1 from the State, establishing its responsibility for road maintenance beginning on the village side of the bridge. The bridge replacement was required by the State. 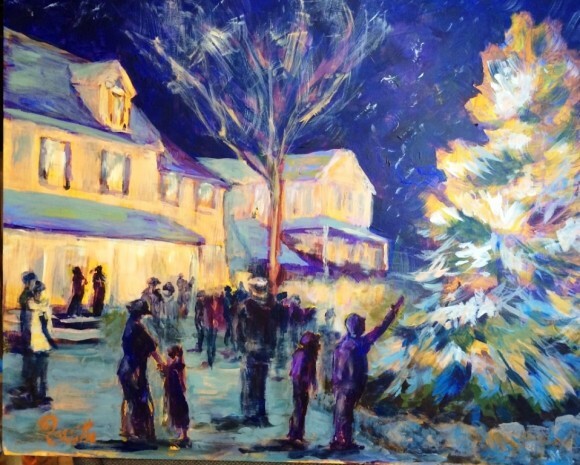 Maple and Main Gallery, located across from the town Christmas tree, will be serving wine, appetizers and chocolates. Music will be provided by Sibling Thrivarly until 8 p.m. Enter the free drawing for an oil painting, “Star Gazing,” by Faye Mylen of Fairfield, her interpretation of Vincent Van Gogh’s painting, “Starry Night.” The painting shown here of Chester’s own Starry Night is by Barbara Rossitto, a Gallery artist. “Fly me to the moon and let me play among the stars,” Frank Sinatra sang. We can’t promise you the moon, but you can certainly play among the stars during Chester’s Starry Night Stroll on Friday, Dec. 4. The annual Holiday Festival in Chester Center will be dazzling with starry specials and activities. The picturesque historic village will be beautifully decorated for the holidays and the streets will be lined with luminaries. 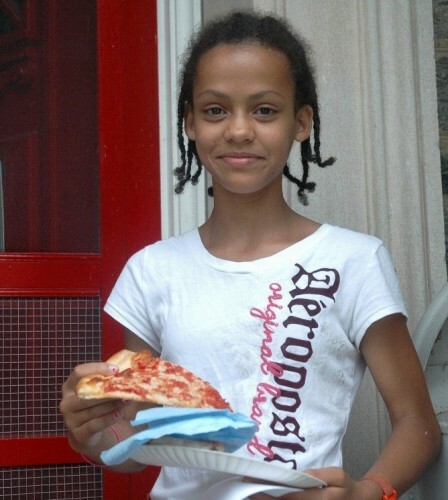 Saint Lucia Girls will walk around offering cookie treats. Carolers will stroll through the village on their way to the town’s Christmas tree, which will be lighted at 6 p.m. while the community gathers for a sing-along. All evening, the shops and galleries will offer light refreshments and beverages while you browse. At the Chester Gallery the annual Postcard Show, where all art is 4×6 inches or smaller, will open with a champagne reception. Leif Nilsson will preview his new works of the Connecticut River Valley and his gardens beginning at 5 p.m. Bill Vollers is reopening Gallery 31 • 47, exhibiting new work in an expanded gallery space. Refreshments will be served. Lori Warner Studio & Gallery will host a reception for Mandy Carroll-Leiva’s new small collection of champagne diamonds serving as the foundation and inspiration. Visit the Dina Varano Gallery to see the unveiling of Dina’s new collection created especially for this holiday season. On this special themed Starry Night, an original hand-painted, starry holiday card will be given away with every purchase. The 4 Water Street businesses are offering prize drawings, sales, refreshments. And that’s just a sampling of what’s happening on Starry Night in Chester! Free parking is available in the Water Street and the Maple Street parking lots, both a short walk to the center. 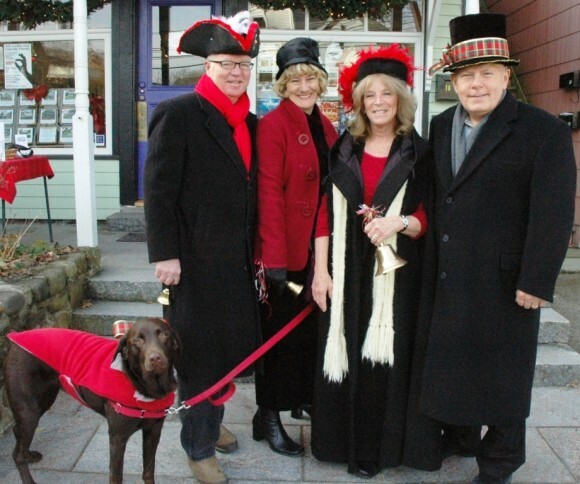 On Sunday, Nov. 29 Chester will “Ring in the Season” at its first Holiday Market of 2015. The town criers will ring out the news of what’s happening in town that morning. 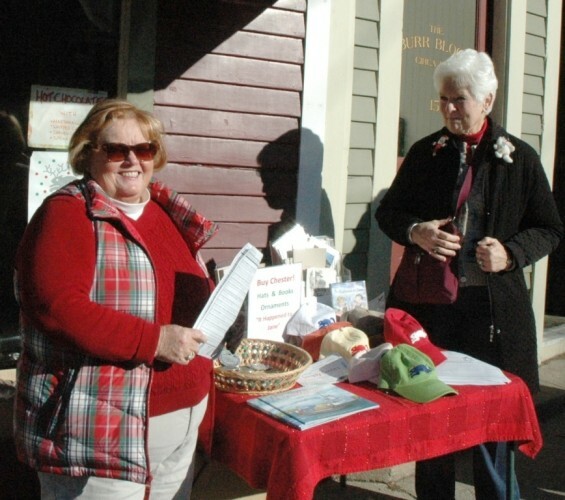 Once again Chester Center will welcome the holidays with its annual Holiday Market on four Sundays, Nov. 29 through Dec. 20, from 11 a.m. to 2 p.m. Stroll through the picturesque historic Chester village while shopping the market of local growers and producers of artisan baked goods, jams and jellies, fall vegetables, fresh seafood and meats. Want fresh seafood? 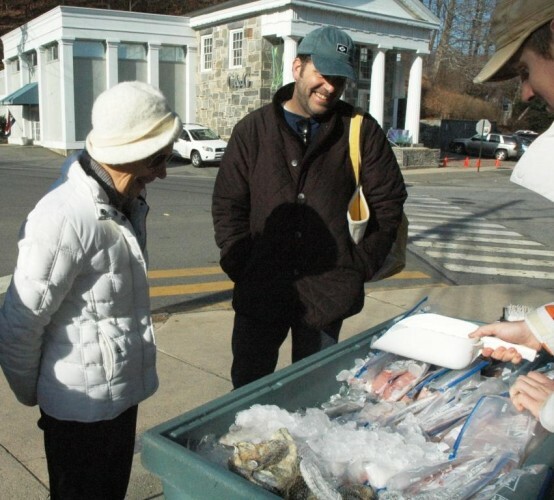 Local Catch will be at the Chester Holiday Markets each week with a wide selection. To add to the holiday spirit, Chester shops, restaurants and galleries will be dressed up in their holiday finery and offering special holiday happenings. On Sunday, Nov. 29, the Holiday Market theme is “Ring in the Season,” so you’ll find ding-a-ling discounts in some shops and town criers ringing out the news of what’s happening in town. Buy Chester! Chester Rotary hats, Chester Historical Society books about Chester, Chester ornaments from every year including the new one – all will be sold at Chester’s Holiday Markets. A schedule of each week’s happenings will be at Facebook.com/ChesterSundayMarket and Facebook.com/VisitChesterCT and will also be available at the market. 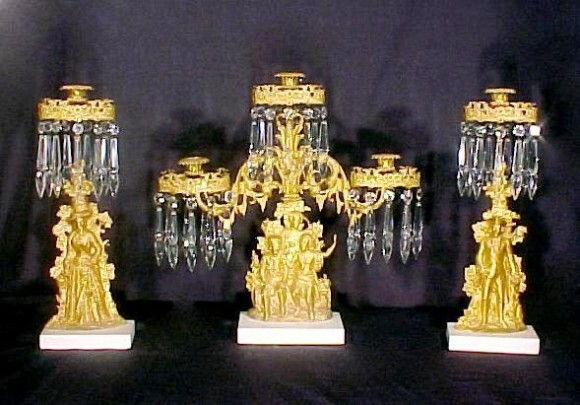 These girondolas were made for the 1876 Centennial and belonged to the Southworth family of Deep River. They have been in place on the Deep River Historical Society’s Stone House parlor mantel for more than 150 years. The two end pieces depict a man and woman dressed in Colonial style with tricorn hat – the center piece is Daniel Boone and an Indian scout plus another figure representing the westward expansion of the US. Thanksgiving is a time of traditions and memories. For the second year in a row, the historical societies of Chester, Deep River and Essex are helping you begin a new tradition while you savor the memories of times past. The three historic museums in the tri-town will be open at no charge on the Friday and Saturday after Thanksgiving so you can visit with your families and friends. Such a welcome alternative to dealing with crowds at the malls! The Deep River Historical Society’s Stone House, built by Deacon Ezra Southworth in 1840, will be open on Friday, Nov. 27, and Saturday, Nov. 28, from 10 a.m. to 4 p.m. Tour the home to see the “Gems of the Society,” collections of Deep River businesses and products including Niland cut glass, and enjoy the preview of this year’s Holiday Festival of Trees, Trains and Traditions. The Stone House, at 245 Main Street in Deep River, For more information, visit www.deepriverhistoricalsociety.org. 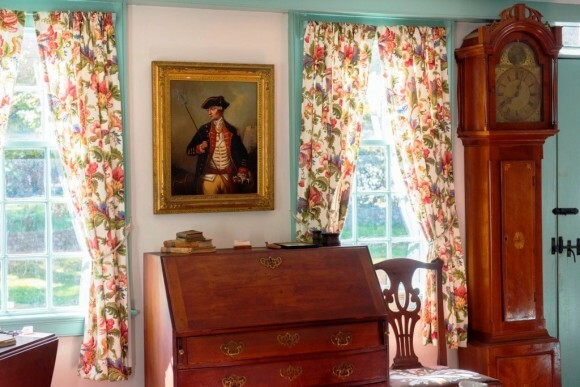 The welcoming parlor of Essex Historical Society’s 18th-century Pratt House awaits your post-Thanksgiving visit on Friday, Nov. 27 and Saturday, Nov. 28. Photo by Jody Dole. Essex Historical Society’s historic Pratt House, located at 19 West Avenue in Essex, will be open to visitors Friday, Nov. 27, and Saturday, Nov. 28, from 11 a.m. to 2 p.m. The house, which was built in stages throughout the 18th century, interprets early farm life and the nine generations of Pratt smithies, many of whom lived there. Tour the house with EHS’s knowledgeable guides and visit its newly expanded museum shop. This holiday season, the house features a new temporary exhibit on Essex’s E.E. Dickinson Witch Hazel Co. as EHS continues to celebrate its 60th anniversary in 2015 with a “Dickinson Year.” For more information, visit www.essexhistory.org. 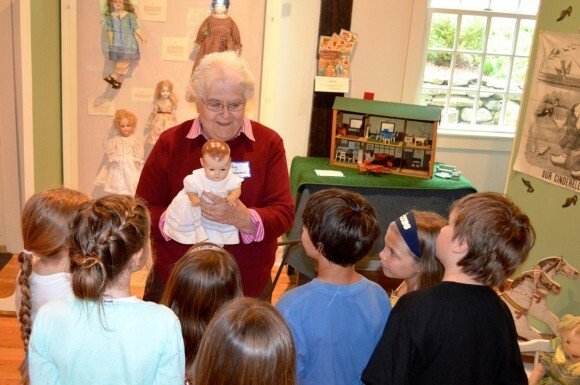 At the Chester Museum at The Mill, listen to Peg Lieberman’s tales about sledding down the streets of Chester right to Jennings Pond and check out her childhood doll in the “Pastimes” exhibit. The Chester Museum at The Mill, at 9 West Main Street in Chester, will also be open on Friday and Saturday after Thanksgiving, from 10 a.m. to 4 p.m. This year’s “Pastimes in Past Times: Chester at Play” exhibit focuses on the ways Chester families spent their leisure time in the “old days.” You can even sit down and enjoy a game of Tiddly Winks and checkers or play the Jaw Harp. It makes no difference where you grew up or when, everything about the exhibit stirs your memories of pastimes you or your family enjoyed and reminds you of what you’d like to pass down to the next generation. For more information, visit www.chesterhistoricalsociety.org. The Chester Historical Society invites you to take this year’s creative challenge. Named Hooked Again!, the challenge is based on products from the Brooks factory. Pick out three sealed envelopes to work with; no one knows exactly what is in them. The Chester Historical Society has come up with its fifth creative challenge linking Chester history and art. This spring, those accepting the 2015 Hooked Again! 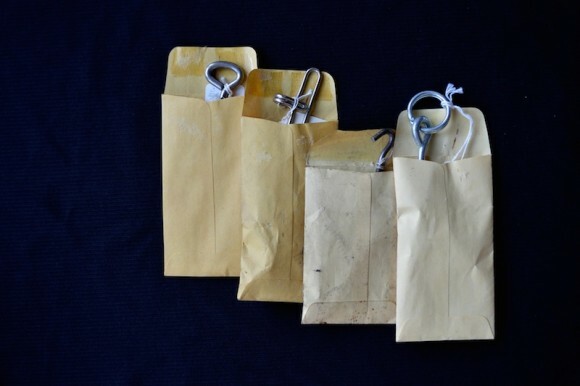 Challenge issued by the Historical Society will be working with assorted sample eyehooks, handles and hardware, still enclosed in small sealed manila envelopes, from the M.S. Brooks & Sons factory. 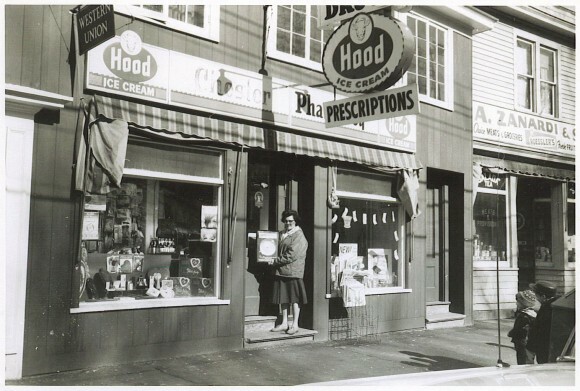 As with the Bishop and Watrous Bone Art challenge and the Bates Square Roots challenge offered by the Chester Historical Society in past years, the Hooked Again! challenge is for area artists, sculptors, photographers, engineers, jewelry designers, and all others with a creative mind. Anyone who wants to take the challenge is invited to stop in at the Chester Gallery on Main Street in the center of Chester to pick out three sealed envelopes and pay their entrance fee of $30, which includes two tickets to the event. The finished works will be exhibited and sold by silent auction at the Historical Society’s Hooked Again! Challenge Reception on Saturday, April 11 from 5:30 to 7:30 p.m. at the Chester Meeting House. For more information, call Sosse Baker at Chester Gallery at 860-526-9822. 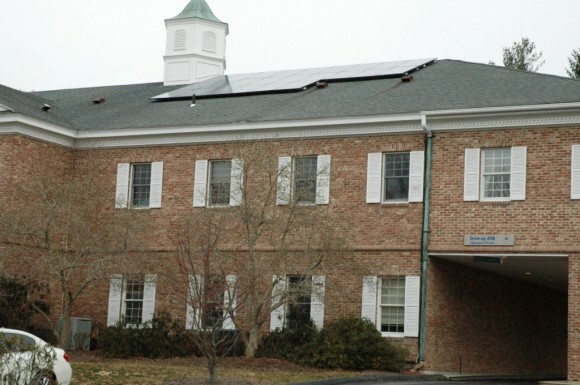 The 24-panel 6kw solar array on Chester Town Hall was awarded to the town for operating the CT Solar Challenge. A ribbon-cutting ceremony will be held on Jan. 29 at 9 a.m.
01/28 Update: This event has now been cancelled and will be rescheduled to a date in February. The Chester Energy Team will host a brief ribbon-cutting ceremony at the Chester Town Hall at 9 a.m. on Thursday, Jan. 29, for the town hall’s 6-kilowatt photovoltaic solar array. Chester community members and public officials are invited to attend. CT Solar Challenge and Aegis, along with energy efficiency professionals from the state’s Home Energy Solutions program, will be there to answer questions about residential solar. The town hall’s photovoltaic solar array, which was installed recently, was awarded to the town for operating the CT Solar Challenge, which resulted in 20 new residential photovoltaic and thermal installations. With the Energy Team’s help, by 2018 Chester hopes to achieve its commitment to the Clean Energy Pledge signed in 2013. More information about the Chester Energy Team is available from the First Selectman’s office (860-526-0018) or at www.ChesterCT.org. 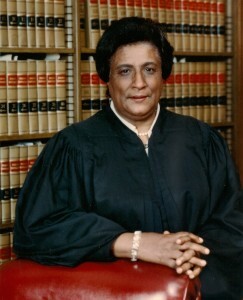 Judge Constance Baker Motley. Photo courtesy Motley Family. To commemorate Black History month and the legacy of the Civil Rights Movement, Chester Public Library will host the PBS film, Justice is a Black Woman, about the life and work of Judge Constance Baker Motley, a key Civil Rights leader who was a Chester resident for many years. The film, followed by a discussion led by local historian Marta Daniels, will take place on Thursday, Jan. 29, at 7 p.m., in the Community Room at Chester Town Hall on Rte. 154. Judge Motley was at the center of America’s Civil Rights firestorm for more than 40 years, first as a brilliant lawyer and strategist with the NAACP Legal Defense Fund under Thurgood Marshall, and later as a federal judge in U.S. District Court. Working closely with Dr. King as one of the movement’s chief litigators between 1940 and 1966, Motley played pivotal roles that helped desegregate southern schools, buses, and lunch counters. As an African American woman, she broke countless barriers and set many records in American history. She was the original author in the landmark 1954 Brown vs. Board of Education, in which the High Court declared unconstitutional state laws establishing separate public schools for black and whites, and in 1962 she argued the case in the Supreme Court that resulted in the admission of James Meredith to the all-white University of Mississippi. 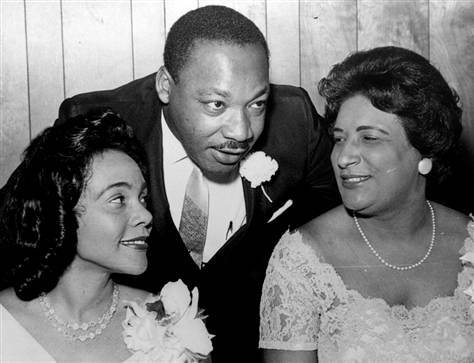 AP file photo: Dr. Martin Luther King Jr. chats with his wife, Coretta, left, and civil rights champion Constance Baker Motley before the start of a Southern Christian Leadership Conference banquet in Aug. 9, 1965, in Birmingham, Ala.
As Dr. King battled in the streets, Attorney Motley fought in the courts. A personal friend of the Kings, she won legal cases that ended segregation in Memphis restaurants and at whites-only lunch counters in Birmingham, Ala. She spent time in Mississippi under armed guard with Medgar Evers, the famous civil rights leader later murdered by the KKK, and she imperiled her own life by being in the courts of the Deep South at a time and place where racial tensions were burning white-hot. In addition to her pioneering Civil Rights efforts, she was the first black woman to be appointed a federal judge (in 1966 by President Lyndon Johnson) and she received the Medal of Honor from President Clinton in 2001. The award-winning film Justice is a Black Woman, produced by Quinnipiac University’s Dr. Gary Ford and Michael Calia, first aired on PBS in 2012. Narrated by Juan Williams, it includes President Bill Clinton, Supreme Court Justice Stephen Breyer, Attorney Vernon Jordan, members of the “Little Rock Nine,” and Dr. Maya Angelou. Anyone interested in understanding the Civil Rights Movement will want to see this film and join the discussion that follows. Participants are also encouraged to watch the new film, Selma, now in area movie theaters to get a better understanding of the richness of Civil Rights history. Chester resident Marta Daniels, part of the Chester Library’s new Human Book program, will lead the discussion. A longtime activist, she has devoted herself to expanding and improving civic engagement in public policy issues related to peace and justice. She participated in Civil Rights marches and voter registration drives in the ‘60s and helped organize the 1968 Poor People’s Campaign, conceived by Dr. King and the Southern Christian Leadership Conference and carried out in the wake of King’s assassination. The campaign organized in support of economic and human rights for poor Americans, and set up a 3000-person tent city (Resurrection City) on the Washington Mall, where participants stayed for six weeks. The library program on Jan. 29 is free and open to the public. No registration is needed. More information is available at Chester Library, 860-526-0018. CHESTER — With the New Year comes a new burst of activity regarding Chester’s proposed new library at North Quarter Park. On Tuesday, Jan. 6, the Library Trustees will request funds from the Board of Selectmen to complete necessary site evaluation work and underwrite the costs of developing schematic plans for a new library building. With the Selectmen’s approval, this request will move to the Board of Finance in mid-January and then to the public for approval. This funding would come from the current year’s budget. The goal is to have this work completed this spring. Got questions? Denny Tovey, Chair of the Library Building Committee, will host a Question and Answer session at the library on Saturday, Jan. 10 from 9:30 to 11 a.m. Drop in for a cup of coffee and share your concerns. The Library Building Committee welcomes community input and encourages your attendance at its monthly meetings that will take place at Chester Town Hall at 7 p.m. on the first Wednesday of the month throughout 2015. Send a message to the library at Library@chesterct.org to be put on the list for building project updates via email. 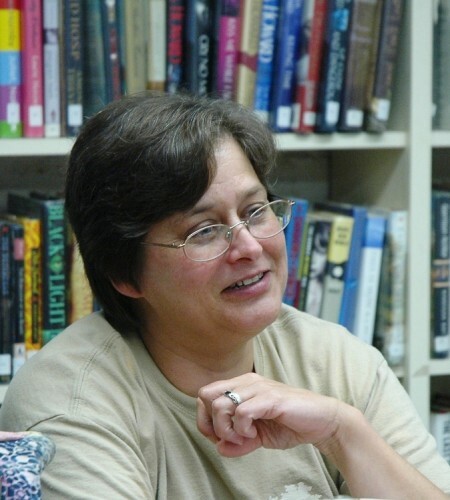 “Views from the South: Looking Forward, Looking Backward” will be the subject of this spring’s Mark Johnson Book Discussion Series at Chester Public Library, once again led by Charlotte Rea. Dates for the discussions are Wednesdays, April 30 and May 7, from 7:30 to 9 p.m.
How does this strong sense of connectedness interact with Southern warmth and pride to create a world in which outsiders are viewed with suspicion? Within this tight world, the characters in these stories yearn for the wider world, for more learning, for greater adventures. The abundant work ethic and risk-taking behaviors shape the characters’ worlds just as their orthodox views of human behavior control their actions. How does this tension between yearning for stability and comfort war with the drive to experience the outside world? What role does the strong sense of the past play as characters shape their own and the region’s futures? The rhythmic, rich language of the three authors becomes a way of life and brings great rewards for the reader. On Wednesday, April 30, discussion will center on Thomas Wolfe’s Look Homeward Angel, in which the protagonist seeks to shape his identity in contrast to and in harmony with his family and Southern community. On Wednesday, May 7, the group will look at the view from two famous women novelists, Flannery O’Connor and Eudora Welty, who in their short stories, “Good Country People” and “Why I Live at the P.O.,” imagine the inner world and outer actions of bright, adventuresome, misfit women living circumscribed lives. Books on paper and on CD are available at the library. EBook versions of both titles can be downloaded from Overdrive. Please call the library at 860-528-0018 to register. Registration is required for these free discussion programs, which are sponsored by the Friends of Chester Public Library. What might you create with these rusted Es for the Chester Historical Society’s Unearthed Challenge on March 22? (Photo courtesy of Skip Hubbard). The Chester Historical Society has come up with another fun challenge linking Chester history and art. This spring, those accepting the 2014 Unearthed Challenge issued by the Historical Society will be working with flat, rusted iron pieces found buried in an early Chester Center property – one of the oldest houses in Chester. 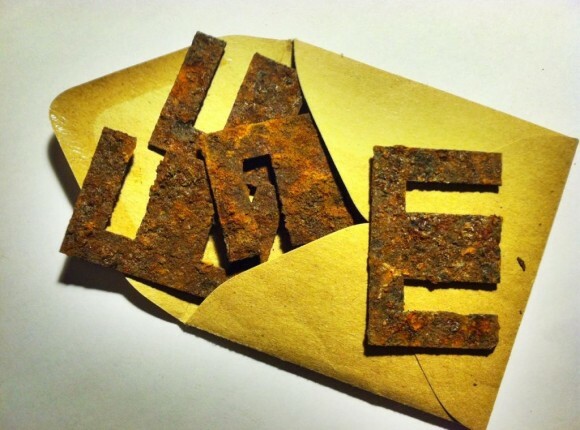 These rusty pieces measure 1 ¼ by 2 inches and look like the capital letter E. We do not know their origin, but they’re a great example of what one might find by digging in their own backyard! As with the Bishop and Watrous Bone Art Challenge and the Bates Square Roots Challenge offered by the Chester Historical Society in past years, the Unearthed Challenge is for area artists, sculptors, photographers, engineers, jewelry designers, and all others with a creative mind. Anyone who wants to take the challenge can stop in at the Chester Gallery on Main Street in the center of Chester to pick up their rusty pieces and pay their entrance fee of $30, which includes two tickets to the event. 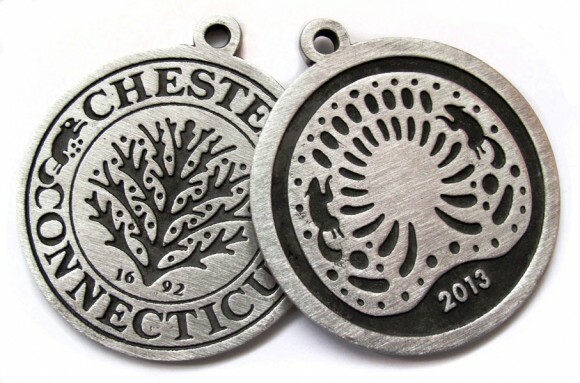 The finished works will be exhibited and sold by silent auction at the Historical Society’s Unearthed Challenge Reception on Saturday, March 22 from 5:30 to 7:30 p.m. at the Chester Meeting House. 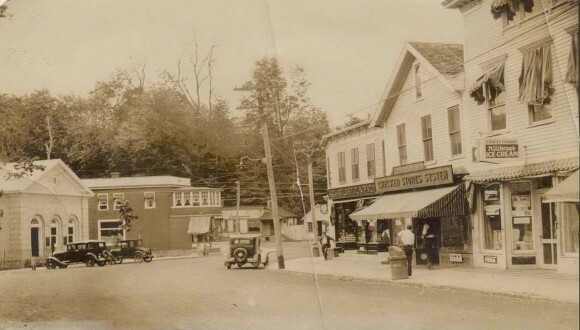 Chester Center had a good many food stores, including the A&P and Checkers Store, as well as several meat markets and even a fish market. Chester is famed for its plentiful restaurants. From pizza and vegan to Italian and French, there’s no shortage of food being professionally prepared and savored in Chester today. There was no shortage of food in the old days either – but it certainly was different! 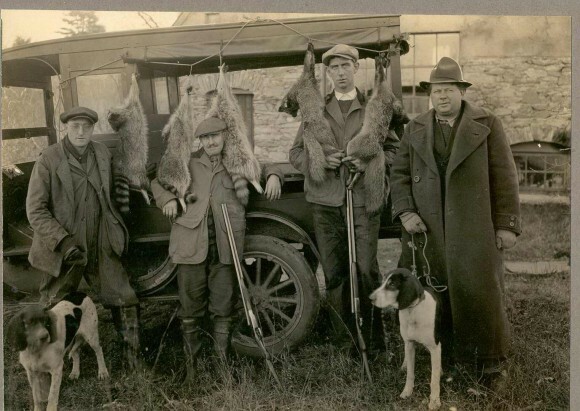 Hunting filled an important need for food, especially during the Depression. Shown here are four Chester men who were known for their hunting skills: Fred Walden, Layton Kelsey, Curt Bishop and Eddie Carlson. 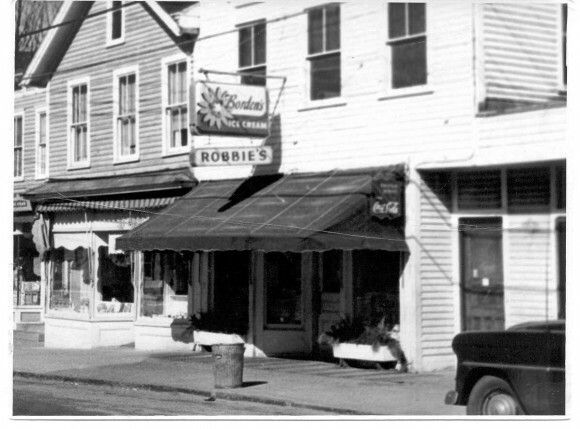 The Chester Historical Society invites you to “Stories from Chester’s Kitchens,” a program featuring tales of Chester’s cooks, food sales and kitchens shared by longtime Chester residents. The program will be Sunday, March 2 at 4:00 p.m. in the Chester Meeting House. 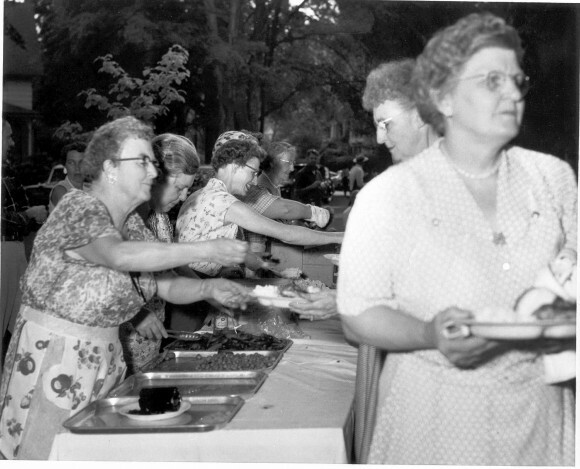 Food sales and townwide banquets hold special memories for many old Chester residents. We’ll be sharing stories at the Historical Society’s Crackerbarrel Program on Sunday, March 2. The program will revolve around the popular crackerbarrel format that has been successful for so many Historical Society programs. Audience participation is encouraged – we want to hear everyone’s memories of Chester’s cooks and kitchens. We’re also planning to show historical photos to whet your appetite for storytelling. This will be a great program for all ages, so children are invited too. The program is free. Refreshments will feature some tastes of Chester’s past. More information at Facebook.com/chestercthistoricalsociety. Chester has a new pewter ornament for 2013. It was created by Peter Good, of Cummings & Good in Chester, and features his tractor seat design from the 2013 Chester Carnivale. The ornaments are being sold at stores throughout Chester Center for $15 each. Profits will benefit Chester Merchants activities such as the 2014 Chester Carnivale. This spring, as the State of Connecticut debated raising the fares for the historic Chester-Hadlyme Ferry, the Chester Historical Society focused on the history of the ferry as it opened its new transportation exhibit, “Over the River and Through the Woods.” After all, the ferry has been an integral part of Chester history since it began in the 1700s. 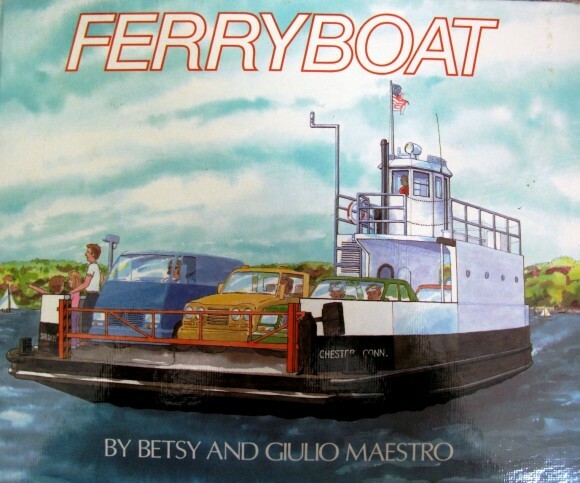 And now the Historical Society has reprinted the children’s book, Ferryboat, written about that historic ferry by Betsy Maestro and illustrated by Giulio Maestro and originally published by HarperCollins in 1986. Ferryboat went out of print several years ago, but the Maestros have permitted the Chester Historical Society to reprint 1000 copies of the book. The Maestros now live in Arizona, “not far from the red rocks of Sedona,” where they continue to write and illustrate children’s books. The book is available for purchase at the Chester Museum at the Mill in Chester, open weekends 10-4, and also at Century 21 Heritage Real Estate office in Chester. 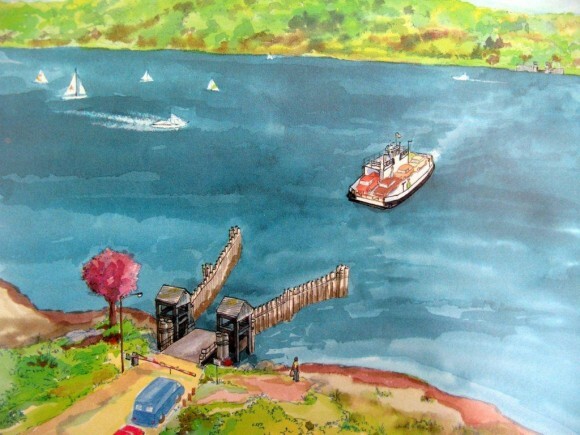 Ferryboat can also be found at the Florence Griswold Museum in Old Lyme; Gillette Castle in East Haddam; and the Connecticut River Museum and the Valley Railroad in Essex. It is priced around $12. The Chester Brochure is being updated and printed this summer by the Chester Merchants. 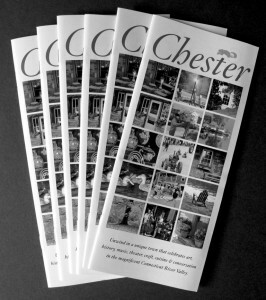 Since 2005, the Chester Merchants have published the Chester Brochure, a guide to the storefront and home-based businesses and artisans of Chester. The 4×8-inch, full-color, 32-page brochure also includes maps, directions, municipal information, and a calendar of annual Chester events. Fifty-thousand copies of the brochure are printed and distributed in tourist outlets throughout the state, area hotels and inns, and local shops and town hall. This summer the Merchants are compiling their third edition, which will be designed by Cummings & Good and printed and distributed in the fall. Ads in the brochure cost $200 or $400, depending on size. The deadline for ad submission and payment is July 15. For more information, email chestermerchants@gmail.com or call Leslie Strauss at 860-526-1200. Veterans and members of Essex Veterans Memorial Hall in Centerbrook are holding their annual Corned Beef Dinner on Sunday, March 10. From noon to 6 p.m. , a corned beef dinner complete with potatoes, cabbage, carrots, Irish soda bread and dessert will be served. Adults pay $10 at the door; children pay $5. Anyone who prefers take-out, may request it. Proceeds from the dinner support our veterans and those currently serving our country. Recently, Ivoryton resident Hunter Sanford was deployed, so the members of the Veterans Memorial Hall will be sending him packages from home. If more information is needed, call 860-767-8892. The Chester Historical Society has come up with another fun challenge linking Chester history and art. This spring, those accepting the 2013 Bone Art Challenge issued by the Historical Society will be working with a “bag of bones” from the Bishop and Watrous Novelty Works. The “bones” were likely to have been handles for flatware or crochet hooks made in the 1930s and ‘40s at the Bishop and Watrous factory on Maple Street in Chester. As with the Brooks for Hooks Challenge and the Bates Square Roots Challenge offered by the Chester Historical Society in past years, the Bishop and Watrous Bone Art Challenge is for area artists, sculptors, photographers, engineers, jewelry designers, and all others with a creative mind. 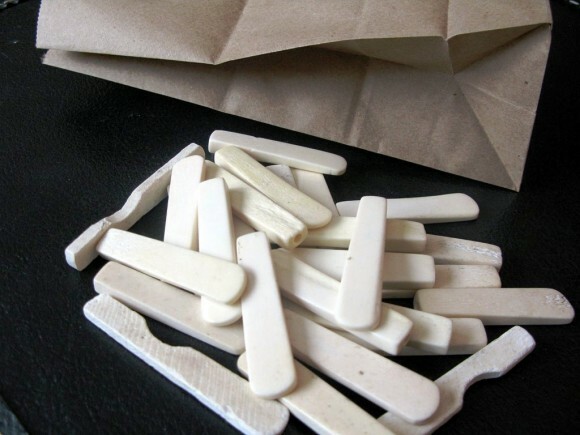 Anyone who wants to take the challenge can stop in at the Chester Gallery on Main Street in the center of Chester to fill a bag with up to 25 bones to create a piece of “Bone Art” for an entrance fee of $25, which includes a ticket to the event. The finished works will be exhibited and sold by silent auction at the Historical Society’s Bone Arts Champagne Reception on Saturday, March 23 from 5:30 to 7:30 p.m. at the Chester Meetinghouse. 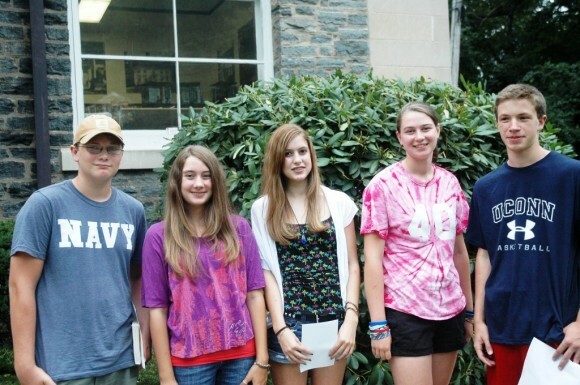 On two evenings in August, several dozen Valley Regional students gathered at the Chester Library to discuss one of the books on their school’s required summer reading list with Chester resident Sally Murray. Shown above are a few of the attendees, left to right, David Ramage, Megan Winslow, Morgan Winslow, Kenna Campbell and Ben Bourez. By attending the discussion, students received a certificate from the library to turn in to the school. Hannah Watkins, a college student and poet from Chester, recorded three letters written in 1862 by Nancie Ayers, her 20-year-old great-great-great-great-aunt, to her brother, a Civil War soldier. The letters can be heard on SoundSticks at the new exhibit at the Chester Museum at The Mill. (Photo courtesy of Keith Dauer). After spending the 2011 season viewing the Civil War through correspondence primarily from soldiers at the front to their families and friends back home, the Chester Historical Society is now balancing what was happening at the front with what was happening at home. Through correspondence, town records, church records and artifacts, a picture of Chester in 1862 emerges in the Chester Museum at The Mill’s new seasonal exhibit, “Beyond the Battlefield.” Featured in the exhibit are letters between a brother and sister, correspondence from a Union surgeon to his wife advising her on gardening necessities at home, records of the local Congregational Church (now the United Church), and the tools and implements used in Chester’s homes and shops. The result is a picture of life at the home front while the Civil War raged in other areas of the country. One of the most poignant aspects of the exhibit, the Dauers say, are the letters between Willis and Nancie Ayers, a brother who saw action in Northern Virginia and was captured by Confederate forces at Chancellorsville in 1863 and his sister who was living in Chester. Portions of her letters have been recorded for the exhibit by Hannah Watkins, the great-great-great-grandniece of Nancie Ayers. Nancie’s words come to life on SoundSticks in the exhibit. The exhibit also contains Silliman inkwells, which were produced in Chester and carried by hundreds of Union soldiers, so they could write home to their families. Also of interest at the Museum this year is a new Chester history treasure hunt for children and their families. The exhibit is open to the public for the 2012 season along with the award-winning permanent exhibit, “Streams of Change: Life & Industry along the Pattaconk.” Regular weekend hours are Saturdays and Sundays from 10 a.m. to 4 p.m. through October. Admission is free. The museum is located at 9 West Main Street (Rte. 148) in Chester (exit 6 off Rte. 9). Chester Historical Society is partnering with five other societies (Middletown, Haddam, East Haddam, Deep River and Old Saybrook) in a two-year joint promotion of the six museums and historical homes titled “Get Lost in Heritage.” Visitors to the sites can enter a drawing for overnight stays at two area inns and receive free “Get Lost” wrist bracelets. Info: www.ctriverheritage.org or 860-526-5765. 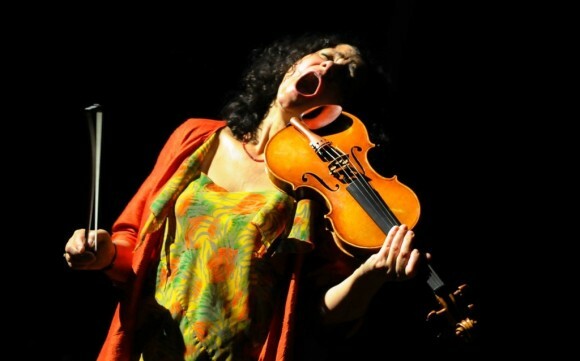 Moravian-born Iva Bittova, vocalist, violinist, avant-garde performer, will be the featured musician at the third concert of the 38th season of the Robbie Collomore Concert Series at the Chester Meetinghouse on Sunday, April 22 at 5 p.m.
Iva Bittova is renowned for giving unique performances that draw upon her training in drama, classical violin and singing. 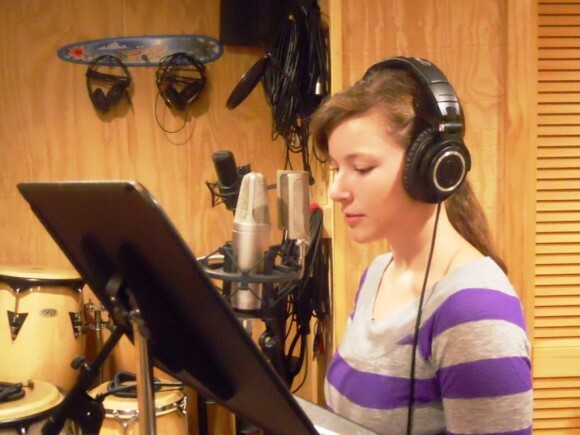 Influenced by jazz, rock, Czechoslovakian folk music and classical violin training, Bittova creates vocal and violin sounds than have always been described as thrilling and impossible to categorize. As expected from an actress featured in a Czech film nominated for an Academy Award in 2004, her performances have a dramatic cohesion that is spellbinding. She will be accompanied by George Mraz, jazz bassist and alto saxophonist. The Collomore Concert Series bring high-caliber, visiting musicians to Chester four times a year. Each performance is followed by a simple reception to mingle with and meet other music lovers and the performer. Tickets are $21 for adults and $5 for students. 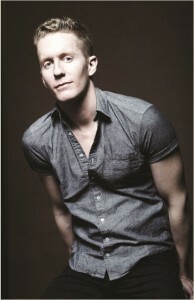 For information and tickets, call 860-526-5162 or visit www.collomoreconcerts.org. Iva Bittova’s performance is sponsored by First Niagara Bank. With so many new books being published every day, why would anyone want to read books written in Greece almost 2500 years ago? Just ask Charlotte Rea, who will be leading a series of three evening discussions on three Greek tragedies in April at the Chester Public Library. Rea, the former Head of School at the Williams School in New London, has an academic background in English and theater, including Greek drama. Rea notes that the plays are easy to read and short, requiring an hour or so to read (though the former schoolteacher admits to encouraging a second reading). Registration is required for these programs, which are brought to you by the Friends of Chester Public Library. Call the library at 860-526-0018, or visit the library website at www.chesterct.org/library.php to register. 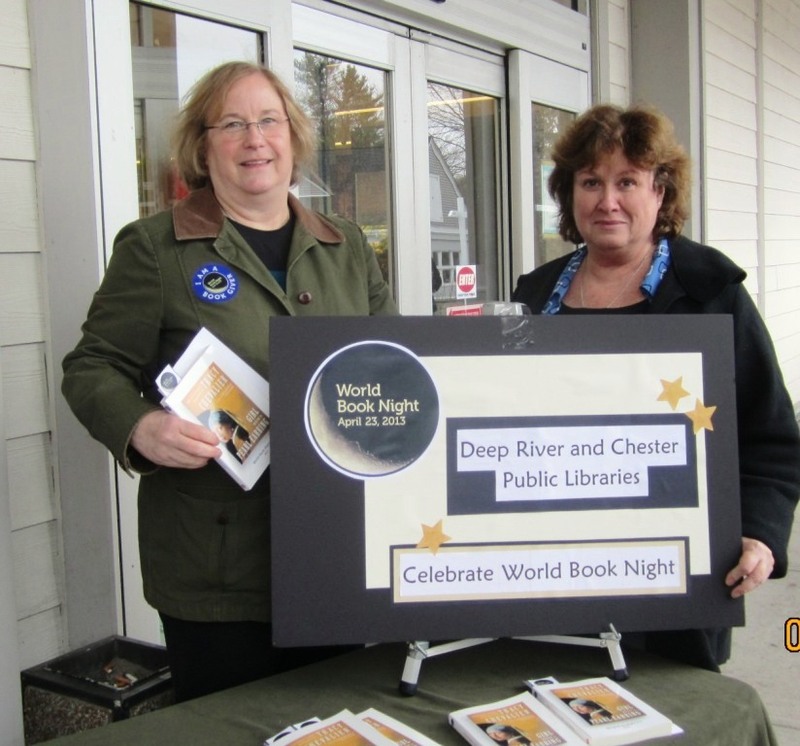 All discussions will be at Chester Public Library from 7:30 to 9 p.m.
Books will be available for loan at Chester Library. Those interested in ebooks may want to check out the texts available through Project Gutenberg.